Address: 3019 Kalakaua Ave, Honolulu, HI 96815. Built in 1961 with 12 Units on 14 Floors, All 2BR Floor plans, Pets: OK (verify). Amenities include 24-hour security surveillance system. Residents can watch the Hilton's Friday night fireworks from the comfort of their lanais. 3019 Kalakaua condos is for homebuyers who like to stretch out in their own private domain – with a view that's simply jaw-dropping. Every condo unit you'll find here is a 2BR, with a lot of room to fill with furniture, friends and anything else that makes you happy. How big are they? Each one has over 2100 sq ft, plus another 400 sq ft in lanai space. That lanai sits over the ocean so you not only get this most treasured of views, you get to sit almost on top of it! This is one of those Gold Coast condos built before regulations required they be built further back from the shore. This is a rare breed of Hawaii real estate, to say the least. The waves aren't something you see off in the distance. They're your welcome companions throughout the day and night, a soothing soundtrack you'll never tire of. Your unit is actually the entire floor, so the elevator opens directly in your home. Step out and you're inside. Many compare life in these condos to living in a house elevated into the sky. With the privacy you have, the complete run of your whole floor and that immediate entrance to your abode, it's easy to understand this feeling. The Gold Coast location grants you easy access to Waikiki, much of it in walking reach, and the shopping & dining of both Ala Moana and Kahala are short drives in either direction. When the outdoors call, you have not only the beach, but also Kapiolani Park sitting outside your back door. When it's time to get the heart racing, you'll find plenty of space to run, jog or walk with Diamond Head as your backdrop. When you can call this your home, you're in prime position for anything you need. It's not just the real estate that's golden, it's the lifestyle itself. 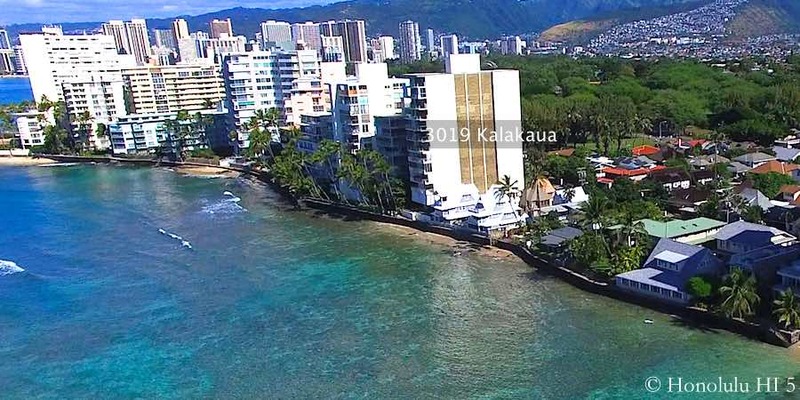 3003 Kalakaua, Seabreeze Apartments, Diamond Head Apartments and Coral Strand. See our Diamond Head CPR article for alternative condo alike properties in Diamond Head. Here is a list of all Diamond Head condos for sale and another of all Honolulu condos for sale.